Good afternoon, Class of 2018! Wow. What a remarkable milestone and moment for you all. Now’s the time to take a breath, pat yourself on the back and savor the feeling. You’re sitting here today because you had a dream, and you chose to pursue it. You worked incredibly hard, applied your unique creativity to everything you touched, and did not stop until you crossed the finish line. So congratulations on successfully graduating from such a prestigious university. Given the elite education offered by this University, you couldn’t have done a better job positioning yourself for whatever your next step in life may be. I’m truly honored to share this momentous occasion in your life. 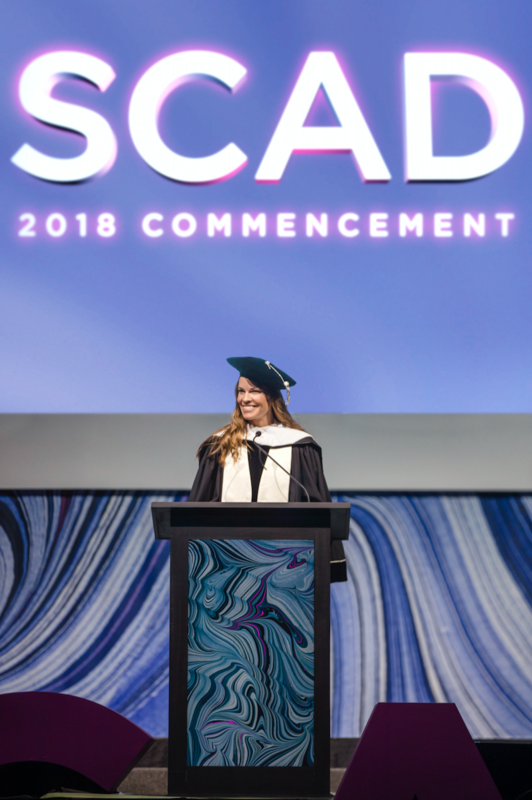 Before I share a few stories with you that hopefully will serve to interest or maybe even inspire you, I’d like to graciously thank President & Founder Paula Wallace and all of the outstanding leaders at SCAD for this honorary doctorate. I’m humbled to receive it and honored to be speaking here today. In addition to MISSION STATEMENT, the clothing line I launched, I assume I was invited to speak here because society has defined my acting career as a “success”. In fact, when I won my first academy award, the press branded me an “overnight success”. Let me take a moment to walk down memory lane to define my “overnight success”. I grew up in a trailer park in a lower socioeconomic background. I was frequently shamed for being “on the wrong side of the tracks” by friends I grew up with, friend’s parents or others in my community. Feeling like an outsider, I quickly connected to characters in films and books, which helped me feel less alone in my insecurities. But we’re jumping ahead… I knew I wanted to be an actor when I was 8 years old. My favorite teacher had us write a skit and perform it in front of the class. When I was up there, I felt time stand still, and every cell of my body came alive. News alert. When you feel something like this in your life, pay attention. It’s the universe telling you you’re on to something. For me, I didn’t quite know it at that young age, but looking back, I knew I had found “my calling”, as I’m sure many of you most likely have during your time at SCAD. That feeling stayed with me while I continued to do many small theatrical performances in my home town. I eventually realized this could be my path in life…what I could be when I “grew up”. I was 14. All I had to do was move thousands of miles to Los Angeles, find enough money to survive, get an agent, and compete with thousands of other actors for very few jobs. Easy, right? Well, at least the first part was made easy as my mom hit a crossroads in her life and chose to help me pursue my dream. So we left the trailer park, drove to Los Angeles with 75 dollars in our pocket and lived out of our car. For several weeks, my mom cold called agents from a payphone until one day an agent was holding auditions for new talent. I thankfully got signed by her and quickly started going on audition after audition after audition. I had hundreds of “no’s” and almost no “yes’s”…I had no idea this overnight success thing would be so hard. Finally, after several years of many setbacks and a few wins with low-paying small gigs, I landed a multi-season acting contract on Beverly Hills 90210. Unfortunately, it was in the 8th season of the show. I didn’t even think the show was airing anymore as did most of America I think.. The actor in me was hoping for better work, but I had to eat, and I knew there were many steps to success, and not all of them would be pretty or easy- so I took the job. And then… I got fired. So there I was as an unemployed actor after several years of hard work – apparently not good enough for the 8th season of Beverly Hills 90210 during its lowest ratings. I couldn’t imagine anyone hiring me for anything after this. 2 months later I booked “Boys Don’t Cry” which won me an Academy Award. But here’s the interesting thing… had I not been fired, I would have been contractually obligated to 90210 and I never would have been able to book the movie. It was a blessing to be fired. So, that’s my overnight success. Nine long, hard, years. That’s one loooong night. Two Academy Awards later and while I was taking time off acting to nurse my father back from a lung transplant, I decided to start a clothing line called “Mission Statement”. Many people told me not to. They told me it would be too hard. They told me that I should stick with what I was good at. Well, I’m stubborn. I also don’t like people telling me what I can or can’t do, especially when it’s about achieving something. So I filtered out all of that noise and I made a choice and I made it happen. I wanted to create a line of stylish high-performance clothing that would empower women throughout their day and night – no matter where they were or what they were doing. I felt that this was a product that the market needed. I knew my wardrobe needed it! Similar to acting, Mission Statement was not an overnight success and it still requires a ton of work. I had to build my own team, raise my own money, and operate it every day (I’m still the main operator of the Company). But I’m thrilled to say I’ve been selling it online for over a year and it will be in Nordstrom’s this summer. So after all of that, here I am today being asked to inspire you on your journey forward. I believe my achievements were a result of my staying true to a few guiding lights. One. Make a choice and then make it happen…Every. Single. Day. Sometimes that means getting out of your own way, whatever that might be: your mindset, a fear, a seeming obstacle, a “setback”… whatever. It doesn’t matter where you’re from, who you’ve been or where you are now. All that matters is that you make choices every single day to work towards your dream. Two. Inevitably, the universe is going to throw some very ugly curve balls at you. No matter what they look like, never assume any of them are bad. We all have our “firing from the 8th season of 90210” moments. They will pass and after the dust settles, be on the look out for the opportunities that are about to present themselves. Three. Ignore what everyone else is doing or what society is telling you to do. Don’t let anyone tell you “how” something needs to be done for you to achieve your goals (including me!). Don’t worry about how fast or slow you’re going compared to others. Speed doesn’t matter. It’s how present you are in each moment that matters. There are a million different paths to your end goal. Any path you choose will likely be long and full of ups and downs, so choose the one that brings you the most joy and makes you feel most alive. And then pursue that goal with all the grit, passion and determination you can muster. And whatever you do…Don’t EVER give up. And Fourth, and this is the most important one, remember that none of your goals are worth anything if you lose perspective on your humanity. At the end of it all, when you’re lying on your deathbed, what matters most is who’s around you and that you’re able to take comfort in the fact that you moved through life with grace, kindness and integrity. So Class of 2018, I wish you this: may your “calling” be clear and beautiful, may you have a deep well of grit and strength within you to pursue your goals, may your hardships be opportunities, and may you be shining beacons of inspiration and positive impact as you move through your life. Hilary Swank is a two-time Best Actress Academy Award winner for her performances in the 1999 drama Boys Don’t Cry as well as Clint Eastwood’s Million Dollar Baby (2005). She is also a multiple SAG and Golden Globe award winner. Swank recently completed production on Grant Sputore's sci-fi thriller I Am Mother and can be seen in What They Had, opposite Blythe Danner and Michael Shannon, to be released by Bleecker Street in Fall 2018. She currently co-stars on FX's limited drama series Trust, based on the true kidnapping of John Paul Getty III. Recent film credits include Logan Lucky, The Homesman and You’re Not You. In 2016, Swank founded and launched Mission Statement, a luxe leisure clothing collection that strikes the perfect balance of high fashion with comfort and performance.